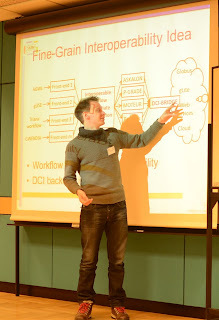 Today represents the first in a series of workshops sessions on scientific workflows - a follow-on workshop is expected to be conducted at the Community Forum in Munich, March 2012. Even with the cold weather, there has been a good turnout with over 20 registrations on Thursday afternoon. Each half-day workshop have been very informative. The first half-day was organised by SHIWA (www.shiwa-workflow.eu) to introduce the SHIWA project, that has been developed so far to help the collaboration of different workflow communities. The second day was organised by EGI (EGI.eu). · What is the purpose of the SHIWA project? What workflow services are delivered during the project? How can these services be useful to a workflow community? How can workflow communities use the SHIWA services (store and submit workflows, etc.)? · What kind of e-Science workflow management system and best practices are the most widely used and/or are emerging within scientific communities? Delegates have travelled from along way to attend. So far, I have met people from the USA, Turkey and Finland. In general, the presentations have sparked off great discussions, and deliberations continued last night during an informal group dinner at a nearby restaurant with unlimited food and drinks.